Dual rack and pinion fence ensure blade and fence are always parallel, integral one-piece fence is adjustable and tilts 0-90 degrees, flush cuts can be made at 0 degrees without removing fence, 45 degree locating notch in fence allows indexing off the outside surface of a mitered joint, non-marring, heavy-duty aluminum shoe, retractable, anti-slip pins, preset depth stops for all common biscuit sizes. Specs: 7/8″ arbor, no load speed 10,000RPM, depth of cut (mm) 20mm, biscuits accepted 0, 10, 20, weighs 6.6lbs. Includes: carbide blade, dust bag, vacuum adapter, torx key, wrench, kit box. 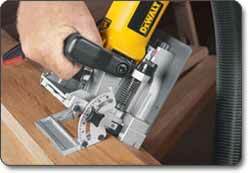 Accuracy is critical when creating joints and The DEWALT Plate Joiner Kit delivers. Its dual rack-and-pinion fence is designed to ensure the blade and fence are always parallel–the toughest part of creating a perfect joint. This one-piece fence is integrated into the joiner’s overall design for convenience, plus it’s adjustable, and can be tilted at angles ranging from 0 to 90 degrees. 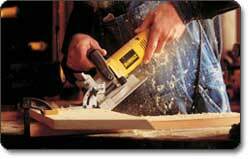 The plate joiner’s configuration allows you to make flush cuts without removing the fence. A 45-degree locating notch in the fence allows for easy indexing of an outside registration. 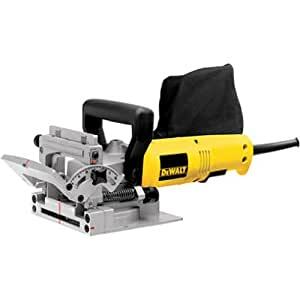 The DW682K’s 6-1/2 amp, 10,000 rpm motor provides plenty of power for making cuts at depth of up to 20 millimeters–even in the hardest woods. The power behind the cut is an integral part of what makes this tool safer, as it prevents unexpected movements with your workpiece. Equipped with a non-marring, heavy-duty aluminum shoe, the DW682K can be clamped down for stable, stationary work. And whether you’re using the joiner clamped down or as a free-moving unit, the retractable, antislip pins help hold your workpiece in place for the perfect cut. And it weighs just 6.6 pounds for easy handling.